ANAHEIM, Calif. — The old veteran came through for Arizona. Of course he did. Junior guard Nick Johnson willed top-seeded Arizona to a 70-64 win over San Diego State on Thursday night in the NCAA tournament, scoring 15 points down the stretch after an 0-for-10 start to the game. By the end, 2 for 12 never looked so good. Rim-outs and bad bounces had Johnson almost convinced it wasn’t going to be his night. But with 2:45 left and Arizona clinging to a three-point lead, the Pac-12 player of the year finally scored — and then scored again and scored some more, leading the Wildcats past the fourth-seeded Aztecs and into the 10th Elite Eight in school history. "I told Rondae (Hollis-Jefferson) when he fouled out not to worry, that we were not going to lose," said Johnson, Arizona’s leader all season. "’Don’t worry. This isn’t going to be the last game of the season.’ They had the confidence in me. It finally went down." Johnson said the team saw him "down and struggling, but they picked me up," and he returned the favor, scoring all of his team-high-tying 15 points in the final 2:43. He made the promise to Hollis-Jefferson with just less than five minutes left. 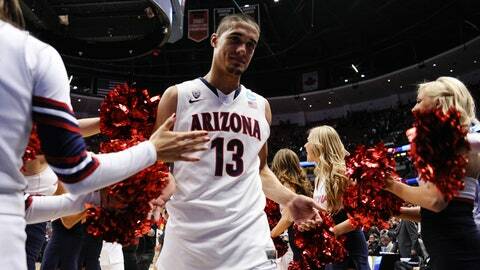 Johnson said that, until the final three minutes, his night resembled his others in Arizona’s losses this season. In the Wildcats’ four defeats, he went a combined 19 for 66 from the field, with a 1-for-14 performance against California the biggest nightmare. "Nick has been resilient all year, and he hung in there through the frustration," said Arizona assistant coach Damon Stoudamire. There was plenty of frustration for Johnson against San Diego State until point guard T.J. McConnell came up with arguably the play of the game, diving to the floor for a steal and making a lead pass that produced Johnson’s first basket. "That was a great hustle play," said Hollis-Jefferson. "T.J. is a great point guard for us. He got that and it kind of turned us around." Or at least it felt that way, as Arizona — which had just pulled ahead by three — outscored San Diego State 16-14 from there. "I stuck my hand in there and saw it rolling and dove for it," said McConnell. "I rolled over and saw Gabe, and Gabe made the great play passing it back to Nick. I thought that was a very pivotal point in the game." "That was probably the biggest play," said Stoudamire. "That was just a case of wanting it more." "Just knowing so much is on me, I take that as a challenge each and every night," Johnson said. "Not to just score but to make plays — when I’m not doing that, it disrupts our team. I was just trying to stay with it." As Johnson said, it was his time … "and I delivered." Not that it was any surprise. The player who’s likely to become Arizona’s fourth consensus All-American — the team’s leader all season — did what he’s done all year. "That’s the Nick I know," Hollis-Jefferson said. If they didn’t know him before, they do now. "Nick’s a great player — he’s got me, Aaron and others when he’s not on fire — but once he starts going, it’s hard to beat us," said Hollis-Jefferson, who also had 15 points. "It was a tremendous last three minutes. Him making all those free throws (10) in a row. That’s pretty hard with all that pressure. There’s a lot of pressure, if you think about it." Johnson didn’t have time to think about it. There was still work to be done. "Nick is a great player," said San Diego State’s Dwayne Polee. "He just exploded in the second half, that’s all I can really say. He just made a lot of good shots." Not exactly, but it probably felt that way. Johnson did most of his damage at the line, hitting 10 free throws in 10 attempts, but it was the 3-pointer just moments after his fast-break layup that was especially big for Arizona. That 3, from a couple of steps behind the arc, came with 1:52 left and put the Wildcats up 59-53. It also came in what Miller referred to as "the most pivotal part of the game" after San Diego State switched to a 1-3-1 following a timeout. "Our guys were ready," Miller said. "Nick got a great look." Miller called the win one of "toughness and resolve," going to those words a few times in his postgame press conference. In 1997, en route to the national championship, Arizona frequented the term "refuse to lose." It applies just as much now as the Wildcats’ tournament run continues and the pressure rises. "You don’t get to this level without having that toughness and resolve that we have," Miller said. "That was the story of the game. Us finding a way, being tough-minded and almost willing our way to the finish line."